It is one of the busiest and best-known places in Washington, D.C. The terminal is served by Amtrak, the Washington Metro transit system of buses and subway trains and MARC and VRE commuter railroads. The facility serves as the headquarters of Amtrak. Today union station has more than 100 specialty shops on three levels and there are more than 35 establishments offering international cuisine. The picture right here is the east side of the union station. 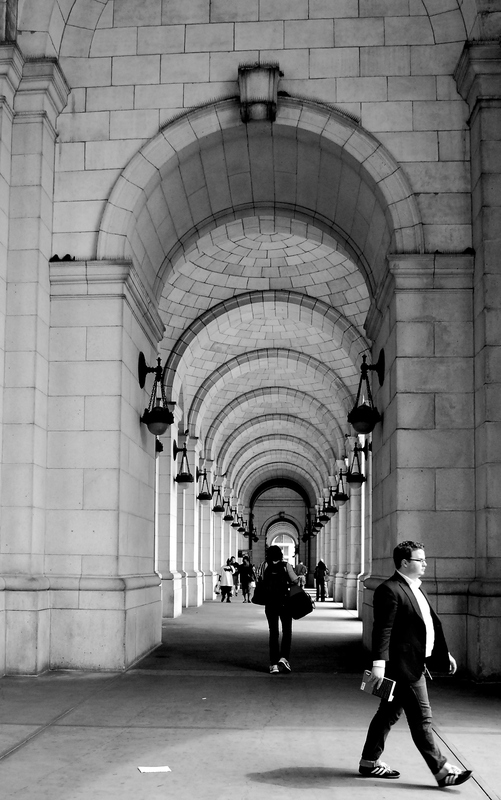 When you get out of the subway, the first thing you’ll notice is the huge corridors or Loggia (name given to an architectural feature, originally of Italian design). You cannot miss it. I assure you when you visit Union Station, you will love it. Editing: Yes, using picasa for black and white effect. Photo Critics are welcome. I want to hear it from the best!